Most of the plants in this room are succulents, which means they are adapted to retain water, thus having the ability to survive long periods of drought conditions. Some succulents store water in their roots, others in their stems or leaves. Although the plants here share an adaptation to a desert environment, this room does not reflect a real desert. There are plants in this room from Africa, Asia, the Americas and all over the world that, in nature, would not be growing side-by-side or within such close proximity to one another. These two groups of plants both have special features for surviving in deserts. Cacti, native to the Americas, have spines that are in fact modified leaves. 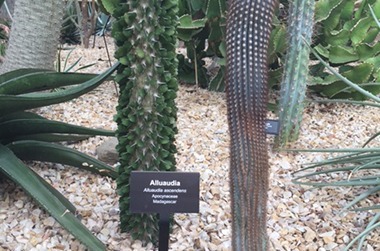 The succulent on the right is a cactus native to Brazil; on the left is a euphorb native to Madagascar. Euphorbs, native mostly to Africa, have thorns that are modified branches. Both thorns and spines serve to dissipate heat and to ward off predators. Cacti and Euphorbs evolved these features to adapt to similar environmental pressures, but in different parts of the world. This is an example of ‘convergent evolution,’ which occurs when unrelated plants from different parts of the world begin to look alike. Like many of the plants in this room, the Century Plant is monocarpic, which means they bloom just once in their lifetime. They put all of their energy into one big flowering event (which is their method of reproduction) and then die. The century plants in this room are mature enough that they could bloom at any time. If you look closely at the Century Plant’s leaves, you can see faint white sun prints that resemble the plant’s leaf shape. These markings serve as a growth chart of sorts. Since all of the leaves stem from the center, they create a series of pale sun prints on the leaves below them as the plant slowly grow larger. 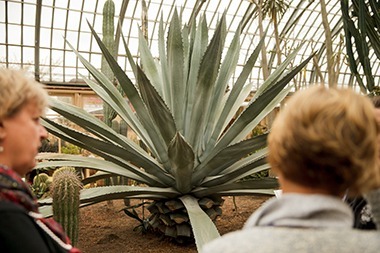 Did you know that there is a cactus native to Illinois? It’s a prickly pear variety that has adapted to our cold winters and rainy seasons (you can find it outside on the Bluestone Terrace). 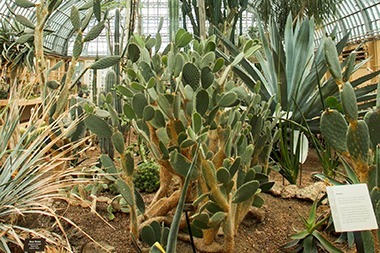 The Plains Prickly Pear you see here is in the Desert House because, despite being from the same family, this plant has adapted to dry desert conditions. This Plains Prickly Pear is native to U.S., Canada and Mexico, and produces a sweet red fruit used in a variety of cuisines.